German Shepherd Dog Forums > Breeding > Genetic Issues > Mei's wavy curls! So, lately a few people have asked if Mei is purebred and/or comment about her wavy curly hair on her back. It's really shiny, wiry hair and only on the top. I think it adds to her unique personality, especially with her little mohawk! This first began when she was about 4 months old and I just thought adult coat coming in, should even out as she gets older. She's 13 months now and still has it. One of her siblings she plays with doesn't have it. 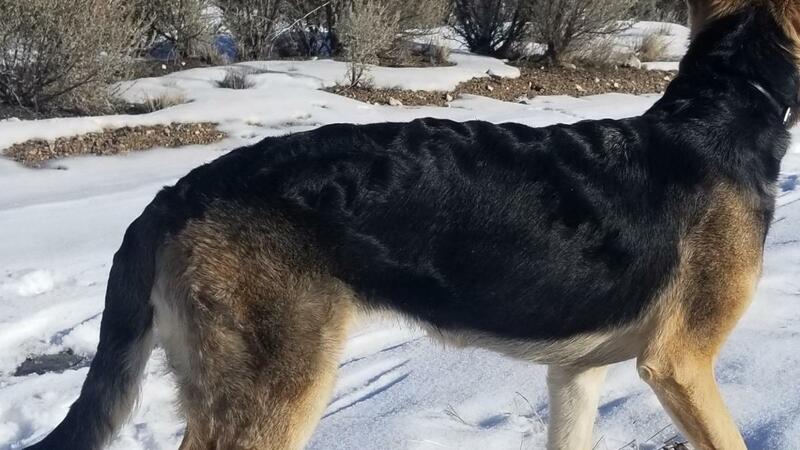 Has anyone seen this uniqueness in a GSD? Is it something that will eventually even out with the rest of her coat? Her sides and hind legs are very soft. Here are some very recent photos. I hope you can see what I'm talking about. my big boy had some waves for awhile but now at 5 he has longish straight hair along his back. Treue's coat did that. It was there her entire life. I have seen it on other dogs. I had read that Erich von Grafenwerth produced wavy coats. I also had a female with a wavy coat, in fact the breeder named her Chessie. Right on, thanks! I'm good if she keeps that her hole life. I was just wondering if anyone else has seen it. With the mountains as a background, Mei's shiney and wavey black coat looks like reversed exposure to those mountains. Quite an interesting pic. Oh, yes I have seen 1 who sported a curly coat. Dont know what that means, reserved exposure, but thanks! Last edited by Heartandsoul; 02-24-2019 at 09:45 PM. As mentioned, Erich v. Grafenwerth, 1920 German Sieger, possessed a slight wave in his coat and passed it on to his descendants. It became known as an "Erich" coat. He was a great dog structurally, but had a slightly unsure temperament, which is why I disagree with v. Stephanitz constant harping about keeping his breed a working breed. He really promoted Roland von Starkenburg as a genetic mutant because of his vast improvement in type. He was also chosen as Sieger in 1906 and had a faulty temperament. All GSDs trace back to Roland. In the 80’s my neighbor has gsd bicolor different looking gsd maybe because overweight but had a wavy coat nice dog her name was Kimber! When max was a pup he had some waves reminded me of Kimber they did go away.